A couple of reviews will be posted this week as we pick up with Dejah/Larka and her fight to discover the truth. SPOILERS AHEAD! After being captured by the Warhoons and their "leader" a red woman, Dejah finds herself deep inside a mine digging for rare gems that can control mens' minds and are being shaped into medallions (again with magic medallions!). Eventually she discovers it ties into a cult of Issus known as the Banth and their scheme to overthrow the Jed of Helium and take over. Dejah has to put her willpower to the test as she attempts to overcome her captor, rescue her friends and discover how to save her beloved city and family. After a somewhat lacking third issue this one picks up the steam and runs with it. While I wasn't crazy about the whole "medallion" subplot Frank Barbiere and artist Francesco Manna moves the story forward with ease and a feeling of direction that was somewhat lacking in the first few issues. Now with a clear purpose to the story being told it moves quickly, added by Manna's artwork that brings the characters and situation to life. There are some hiccups I'll admit. I can't say having our heroine go against another cult is original but it was something Edgar Rice Burroughs himself did quite a bit so I don't have a problem with it. 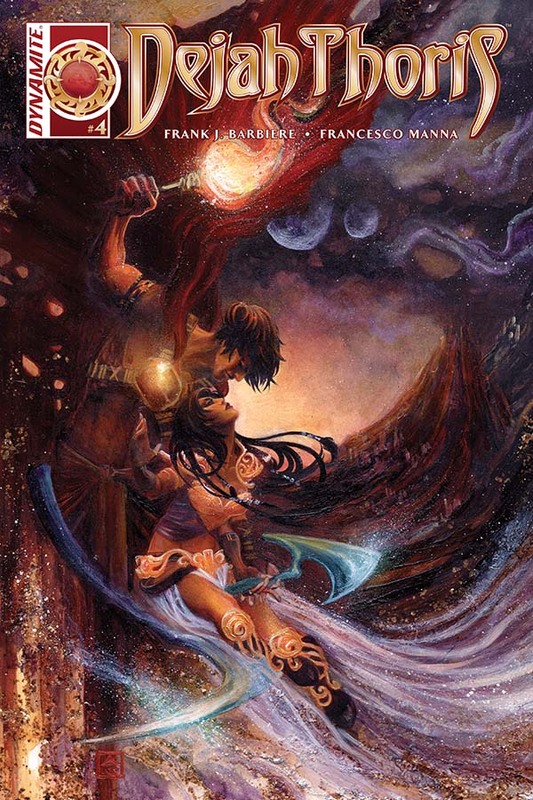 I do have a problem with Manna's version of John Carter though. 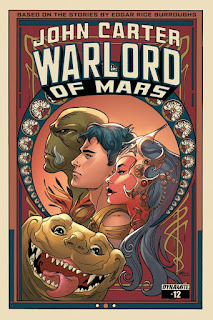 With his moptop look and design he looks like he should be a teenage singing program, not Warlord of Barsoom. Oh well maybe it will improve. If like me you weren't crazy about the last few issues try to give this one a chance. It may not change your mind but you will still come away enjoying. Until next time faithful readers. 'Legend of Tarzan' New Spot-He Speaks! 'Flash Gordon' Gets Funko Pop Treatment! 'John Carter' Special Event Planned? 'The Legend of Tarzan' TV Spots and Images!